Hooked on “musicals” since Gene Kelly danced over a sofa singing “it’s great to stay up late” and then splashed and danced his way down the high street “singing in the rain”, I’ve long since enjoyed this particular genre and have occasionally been known to impersonate Kelly splashing about in a downpour. I always manage to find a big puddle, but the rest? Well, Kelly was a genius in tap-shoes and me, I just get very wet. But, after watching the final performance of Cameron Mackintosh’s 25th anniversary production at the Lowry Theatre in Salford Quays, I wish I’d gone to see it sooner; it was first-class and I was wrong! Prolonged and great dramatic intensity and misery can be performed perfectly well to music. It didn’t make me want to dance down the streets though (and it was temptingly pouring with rain in Manchester – again), but it did make me dab my eyes surreptitiously with a tissue many times throughout the performance. So be prepared, there’s hardly a laugh in over 3 hours – it really is “The Glums”! For those of you unfamiliar with Les Miz (as it is now commonly known), it was written by the French novelist, poet, dramatist and artist, Victor Hugo (1802 – 1885) in 1862 and apart from The Hunchback of Notre Dame (1831) it is his best known work. The son of a Napoleonic General, he was born in France in 1802 and began writing verses and plays at an early age receiving gifts from the French Monarchy for his work. By the time he began to write Les Misérables, he was already a Peer of France and a supporter of right-wing politics. But in his middle years around the time of the overthrow of Louis Philippe, he was radicalised and joined the barricades to fight against Napoleon III. Refusing an amnesty he was exiled, and it was during his time in Guernsey that he finished Les Misérables only returning to Paris after the downfall of Napoleon III. In summing up what he meant by the title of this work, he said that “people reduced to the extremity of need with everything lost to them, hounded by desperation appear depraved, corrupt, vile and odious. 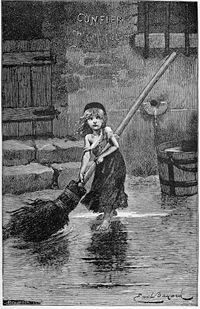 It is rare for those that have sunk so low not to be degraded in the process, and there comes a point, moreover, where the unfortunate and infamous are grouped together, merged in a single fateful world – they are the outcasts, the underdogs - Les Misérables”. It is the story of Jean Valjean, a convict freshly out of prison after serving nineteen years hard labour for stealing a loaf of bread. The original sentence was five years; unsuccessful escape attempts and the resulting additional time pushed it to a grand total of nineteen years. He believed that his sentence was grossly out of proportion to his crime, and by the time of his release he had built up a tremendous bitterness toward society. This bitterness was only intensified by the rejection and scorn which he experienced in attempting to find work and lodging immediately after his release; he was determined to have his revenge against society and against God in some form or fashion. But an unthinkable act of mercy and generosity by a saintly small-town bishop drastically alters the trajectory of Valjean’s life. From that point on, Valjean determines to live as an honest man, and through the rest of the story he struggles–quite imperfectly at times–to become an honest man. Javert, an extremely zealous police chief who once supervised Valjean’s work gang, is never far behind, and is determined to have Valjean back in prison for breaking parole. Monsieur and Madame Thenardier, the owners of an Inn in Montfermeil, are also pursuing Valjean for their own corrupt and dishonest ends. Along the way he takes on the care of Cosette, the daughter of the wronged and desperate Fantine, who dies in destitution. The story takes us from one end of France to the other, from the very top of Parisian society to the very bottom, from Waterloo to the July Revolution of 1830 and the student-led uprising of 1832 which serves as the story’s climax. It paints a vivid picture of Paris’s seamier side, discusses the causes and results of revolution, and includes topics ranging from the Battle of Waterloo to Parisian street slang. But the two central themes that dominate the novel are the moral redemption of its main character, Jean Valjean, an ex-convict, and the moral redemption of a nation through revolution. Victor Hugo said: ‘‘I condemn slavery, I banish poverty, I teach ignorance, I treat disease, I lighten the night, and I hate hatred. That is what I am, and that is why I have written Les Misérables.’’ The novel is a critical statement against human suffering, poverty, and ignorance. Its purpose is as much political as it is artistic. At its essence, it is a plea for humane treatment and equality for all. This creation was an extra-special and almost cinematic treat with imaginative and evocative set design – the most inventive and enthralling I’ve seen on stage. The changing backdrop of scenery was inspired by Hugo’s landscape drawings and paintings and beautifully lit to evoke the feeling of Paris by night and various other landscapes. At times it felt as if you were engulfed in an enormous painting in a virtual art gallery which added to the enigmatic sense of the whole production and of course was a nod of respect to Hugo himself, who was also a very good artist. Clever use of painted tunnels with a virtual reality effect and orchestrated lighting had you transported to and rolling around in the depths of the underground sewers in one escape scene as Paris burnt above in revolutionary times. The set was shifted seamlessly and with perfect timing and while much of it was elaborate in keeping with the goings-on in this story, the hospital and death-bed scenes were appropriately minimalistic with the cast swathed in white to radiate the ethereal ambience. There are many twists and turns throughout the 20 years of this story, and Valjean as depicted in this performance by John Owen-Jones portrays every human emotion with heart-wrenching poignancy. The despair and elation of Valjean’s life story is equally matched by the range of Owen-Jones’s incredible and beautiful voice with which he manages to evoke rage, bitterness, injustice, love and compassion with flair and panache. It is a credit to his brilliant performance that the poignancy is not overdone and I was not surprised to discover that he has been voted the best “Les Miz” performer ever in an on-line worldwide poll of fans of the show. Madalena Alberto’s petite Fantine filled the stage effortlessly with a huge rendition of ‘I Dreamed A Dream’ (far better than the Susan Boyle version), and there were many other great musical numbers performed individually or in groups. Lynne Wilmot and Ashley Artus had great fun providing the only few humorous moments in the whole show, as the Innkeepers Monsieur and Madame Thenardier, bringing some much needed light-heartedness to the proceedings as they skipped from inn to street and sewer in an accomplished double-act like a pair of Parisian artful dodgers. 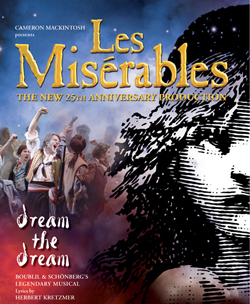 Gareth Gates (he of pop-idol fame) is surprisingly good in the role of Marius, the young revolutionary and love-interest; his voice was smooth and angelic. Katie Hall as Cosette glided along effortlessly singing beautifully and had great chemistry with Gates. It is unfair to name so few, as there was not a weak performance to be had from a single one of this strong and talented cast. The dance routines were performed with precision like perfection and the grace of a ballet. The vocals were mesmerising; almost operatic at times. The orchestra sublime, the backdrop stunning and the performances sufficiently tortured and flawless. You could smell the fear, feel the despair and almost touch the atmosphere – a truly compelling performance of a great and epic tale. The huge Lowry Lyric Theatre provided the ideal setting for such a big performance and was full to capacity, with the audience showing their approval with a standing ovation that lasted over 10 minutes on the final night of its current run in Manchester. There is so much more to this story though that can only truly be discovered in the book. There are also many very good TV, film and radio versions that provide additional detail. And whilst you can’t really expect musical theatre to accurately depict everything Hugo wrote about in his epic tale of injustice and human endeavour, this show manages to combine the words and music with great emotion and integrity. It truly was an enthralling production and brilliant performance – so don’t do what I did and wait twenty five years before you go and see it! After howling into your hanky all night you might need a drink or two in the bar afterwards or may want to stock up on your alcohol supply on the way home. It wont be too long before the cost of a drink or two is increased - in Manchester at least - as there are plans to introduce a by-law and fix a minimum price. It's said to be for the good of our health and to keep the streets free of Gene Kelly impersonators and other dis-orderly ilk of course, but that's open to question, as are the practicalities of administering such a law. The Manchester Salon will be discussing this matter at September's meeting entitled 'Calling time on choice: minimum pricing of alchohol - why not come along and raise a glass or two whilst discussing this coercive and misguided proposal?